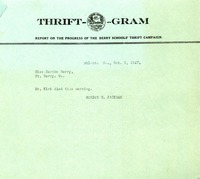 Mrs. Hammond asks Martha Berry to send a statement to the Woman's Committee for Hoover stating why she is supporting Hoover and how many of Berry's faculty will vote for him as well. 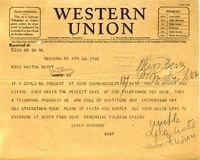 She also asks for Miss Berry to send names of influential women in Georgia, Tennessee, and Kentucky who support Hoover. Mrs. Hammond wishes she could be present for Miss Berry's commencement but says she will be there in spirit. 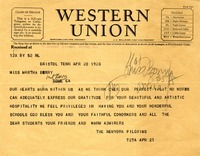 The Pilgrims thank Martha Berry for her hospitality on their visit to the Schools and praise the school, students, Miss Berry, and her coworkers. 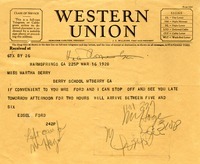 Edsel Ford sends Martha Berry a telegram telling her of a planned visit the next day. 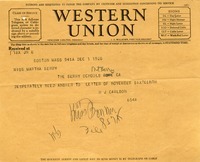 Architect Harry J. Carlson writes that an answer to his letter of November 16 is desperately needed. 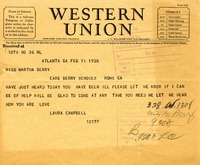 Laura Campbell asks Martha Berry if she is not well and if there is anything she can do to help. 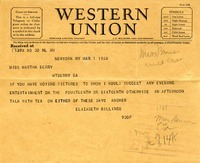 Ms. Billings suggests a evening entertainment for either the 14th or 16th. 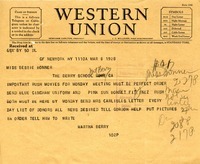 Berry sends instructions to Bonner, including asking her to rush to New York movies, a blue gingham uniform, and a pink sun bonnet that will fit Inez. 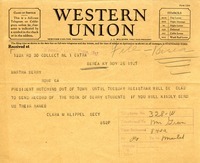 A telegram to Pleasant A. Stovall from Martha Berry asking that a dozen copies of paper be mailed to her with a statement of cost. 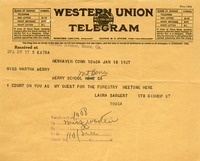 This is a Western Union telegram from Laura Sargent to Martha Berry simply indicating her expectation of having Martha Berry as a guest at a forestry meeting. 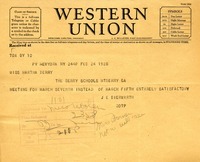 Ms. Klippel informs Miss Berry that President Hutchins is out of town but if she sends the the names of Berry students to her, the registrar can send a record of their work to Miss Berry. Ms. Jackson writes that Mr. Kirk died that morning. 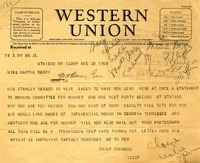 Martha Berry sends a telegram to the Proprietor of Henry Grady Hotel in Atlanta saying that she left a satchel in room 1427 and asks him to keep it for her. The Hoehlers send that they wish they could have been there for the anniversary celebration, but were held up by rain.